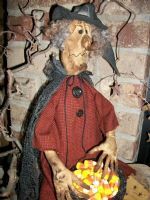 Wilhelmina Witch, 26" is featured in the 2010 Aug/Sept issue of the Country Sampler Magazine. She is a cloth doll made from muslin fabric. She has beady black eyes and a long crooked nose that you can bend into any shape you want! Wilhelmina is wearing a Bittersweet colored homespun dress with a mustard and black star adorned underskirt. She has on black pointy boots with purple stripes up her leg. In between each stripe is a small black button. But her best feature is her hands. Just look at those fingers! Each finger has a wire in it so you can bend them however you want! The Creepier the better! I have also made a caldron for her to hold. It is made with paper Mache and painted black. It is meant for display purposes only and is not recommended to use as a real candy dish. 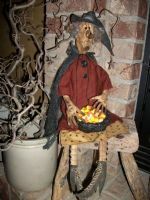 What an awesome addition to your Halloween decor! Can't you just see Wilhelmina greeting your Trick or Treaters this year? $52.50. FREE SHIPPING IN U.S. 48. Others Email me for shipping costs.